Want a salmon recipe that will make your taste-buds sing? Try a Thai approach! The 'big four flavors' of Thai cuisine (sweet, sour, salty, and spicy) marry beautifully with salmon, providing an abundance of taste without overwhelming the fresh flavor of the fish. And the marinades/sauces that make up these dishes are good for you too - low in fat and calories, but very high in taste - a perfect compliment to the health benefits of salmon. Give one a try for dinner tonight! This salmon recipe is melt-in-your-mouth delicious! 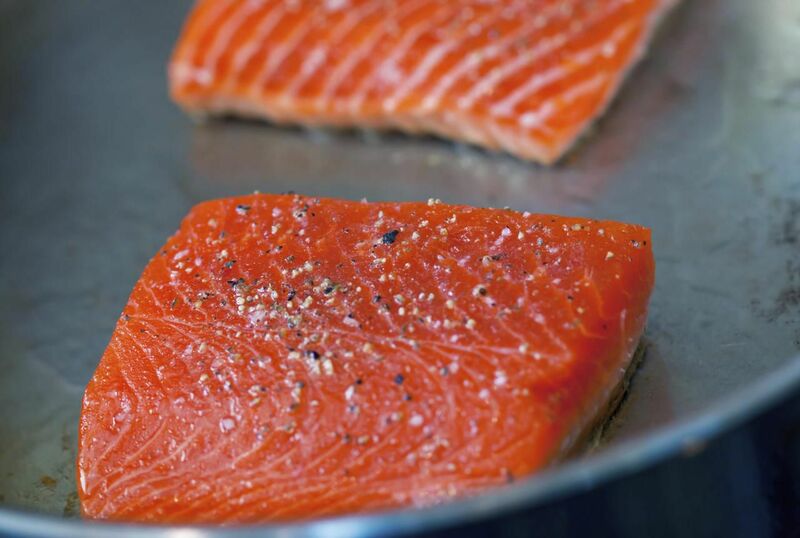 Fillets of marinated salmon are grilled or pan-fried, searing in the flavors and omega-3 goodness of the fish. The salmon is then served with a tangy Thai lemongrass-honey sauce that marries perfectly with salmon's natural flavors. A healthy, low-fat, and extremely delicious recipe that can be made in under 30 minutes. Great for an everyday dinner entree that even your kids will love. This Chinese-inspired baked salmon is gourmet-delicious, yet extremely easy to make. You'll love how the rich-tasting black bean sauce enhances the exquisite flavor of the salmon. This baked fish recipe also works with other types of fish, such as cod, sole, snapper, or halibut - all healthy and safe seafood choices (either fresh or frozen). This easy baked fish is superb for everyday meals, but also wonderful enough to serve to a taste-discerning crowd. ENJOY! This fantastic recipe for grilled salmon is easy to make and tastes truly heavenly. The special Thai marinade is a perfect match for the richness of salmon, enhancing and bringing out all of its naturally succulent taste. Finish this dish with a no-cook coconut sauce, and you have the perfect salmon recipe for your barbecue or cookout! This baked salmon is aromatic and delicious. Salmon steaks or fillets are baked for 20 minutes in an easy-to-make Thai red curry sauce that complements the rich taste of the salmon. But unlike a lot of salmon sauce recipes, this one is lactose-free, calling for coconut milk instead of cream. If you're game, cook or serve this salmon ​in a banana leaf boat (as pictured here) - "how to" link included with recipe. ENJOY! This baked salmon with a honey-soy-ginger sauce comes out beautifully, plus is easy to make. The marinade is a simple mixture of Asian sauces and fresh spices that comes out tasting similar to Teriyaki, but is essentially Chinese-Thai in origin. This is one of my personal go-to recipes when I want delicious-tasting salmon without too much fuss and bother. Great with rice, but also lovely with new potatoes - just spoon over some of the extra sauce from the baking dish and they're yummy! I recently made this fish curry with salmon, and it was very yummy. Salmon works extremely well with curry flavors, I find, especially in this recipe where the curry sauce is rich but not overwhelmingly strong. Frozen salmon works just as well as fresh. ENJOY! This barbecue fish recipe smells so good on the barbecue that you just might find the neighbors coming around to see what you're cooking. Marinated in a tangy Thai sauce (which is also used as a dipping sauce), these healthy, colorful skewers will satisfy the whole family - even your kids will love them. Make up your own combination of vegetables and fish, according to your preference or what you happen to have on hand that's fresh and good. This Grilled Salmon with Thai Lemongrass-Coconut Sauce is just perfect for fresh salmon steaks or fillets (you can use previously frozen salmon as well). The sauce can be made up in minutes and is a delightful mingling of sweet, sour, and spicy. All these flavors come together in a lemony blend of lemon, lemongrass, coconut milk, honey, and a dash of spice (garlic and chili) for a salmon-perfect combination. Copyright Darlene A. Schmidt, About.com Corp. This Thai Grilled Salmon features a wonderful blend of the 'four big Thai tastes': spicy, salty, sweet and sour. Made with fresh herbs and spices, this salmon simply sings with flavor while never overwhelming the naturally delicious flavor of the fish. The marinade is a variation of traditional Thai 'magic paste' - a special blend of fresh herbs and spices that will simply 'wow' your taste buds.